As the Google Nexus 5 is officially released it has ended the anticipation of a wide number of people. The smartphone is looking good and is likely to meet the expectations of the fans waiting in anticipation. The top notch hardware of the device is quite impressive. The device is likely to do well in the market. Its previous version, i.e. Google Nexus 4 was also a huge hit in the market and offered some brilliant specifications. 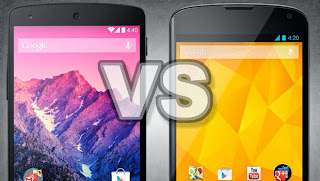 Following is a brief comparison of both these great devices. Google Nexus 5 comes with a bigger display as compared to the 4.7 inch screen of Nexus 4. The full HD IPS+ display of Nexus 5 has got a brilliant pixel density of 445 ppi and is protected by Corning Gorilla Glass 3. On the other hand, Nexus 4 also sports a 4.7 inch HD IPS+ LCD display has got pixel density of 320 ppi and is covered by Corning Gorilla Glass 2. In terms of viewing angles and contrast there is hardly any difference between the two. A new addition to Nexus 5 is the 8 MP rear camera that comes with OIS. Apart from it there is a 1.3 MP front facing camera for video calls. It is a great improvement over the average camera of Nexus 4. The OIS is very effective in capturing sharper videos and images. The addition apart from the specs is that the updated camera app that comes with Android 4.4 KitKat has got features like 360 degree shots and Photo Sphere for Panorama. Among the highlights of Nexus 5 is the 2.3 GHz Qualcomm Snapdragon 800 processor which makes the device lightning fast. It is complimented by Adreno 330 GPU. On the other hand, Nexus 4 had just 1.5 GHz quad core Krait Snapdragon processor along with Adreno 320 GPU. Another upgrade is in the battery as 2300 mAh of Nexus 5 which fares much better than the 2100 mAh of Nexus 4 with improved talk time and standby time. However, to disappointment of some fans the device still lacks the micoSD card support. Nexus 5 is the first device to run on Google Android 4.4 KitKat version which is definitely an improved offering of Jelly Bean. The Nexus 4 will also be receiving the updated. The new version comes with some new features like Google powered Caller ID and a smart dialler etc. On software front, both the devices are almost similar. Lastly, upgrading from Google Nexus 4 to Nexus 5 isn't a bad choice if you are looking for a much faster performance and results. The Android 4.4 software is surely among the best and complements the device hardware specs really well. Anzer Khan is a professional article writer and mobile and technology are his favorite topics. He rates Google Nexus 5 as a great product and supports the device. If you are looking for good deals on this device then do log on to http://www.nexus5contractdeals.com.